*This review was originally published on Movie Mezzanine. 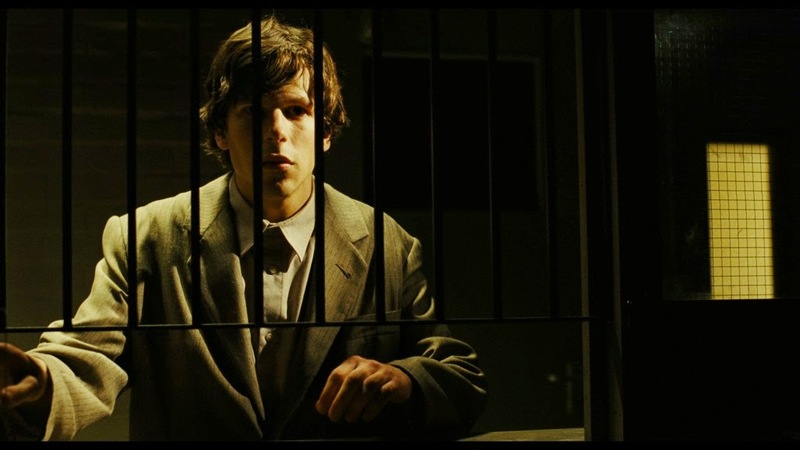 The Double opens with a medium close-up shot of Simon James (Jesse Eisenberg), seated in a moving train. The lights in the tunnel fill the frame intermittently, as do the eerily flickering lights in the train car. Simon seems lost in the disturbing harmony of the moment until silence is interrupted by a mysterious man telling him that he is occupying the man’s seat. The next shot shows the car to be nearly empty, but Simon complies with absolute meekness and spends the rest of the ride stood, leaving the seat to the man. This small interaction in the opening sequence summarizes the state of Simon’s life, his timid character and his infatuation with a coworker – a woman we first meet here as Simon’s gaze fixates on her through the small window to the adjacent car. The Double is Richard Ayoade’s second feature film, following 2010’s cutesy and artfully designed Submarine. For his next try behind the camera, the British comedian has chosen to adapt Fyodor Dostoevsky’s novella of the same name. In the original text, the protagonist Yakov Petrovich Golyadkin is a government employee. Here, renamed to Simon James, the man works at a mysterious company, the job of which few but Simon himself seem to understand. But the nature of the job isn’t of importance and neither are most other plot details. This is a film that conveys its story through atmosphere and mood, rather than sequential plot points. That we learn Simon’s project to be about regression analysis doesn’t tell us about the dull repetition of his job so much as the image of claustrophobic, identical cubicles in which he sits next to other nameless faces, clacking away on his keyboards as the maniacal manager Mr. Papadopoulos – a hysterically hilarious Wallace Shawn – imparts frequent wisdom about productivity. Ayoade’s The Double is essentially timeless. It exists in a universe as much informed by Orwellian paranoia and Kafkaesque psychological terror as it is by Dostoevsky’s original text. This isn’t our contemporary office environment, nor is it of any particular time in the past. Then again, the specificities of time are unimportant, as this temporal ambiguity exaggerates the environment’s absurdity; shaping the mood is what Ayoade is aiming for. This office and Simon’s ghostly, unadorned apartment close in on the audience much as they do on Simon. Cinematographer Erik Wilson uses harsh lighting in minimal doses and leaves large portions of the frame in utter darkness, compounding the sense of mystery and extending Simon’s agitation to the audience. Simon’s life continues with the same routines: he is unrecognized by his coworkers, gets stopped by the office guard every day, and is unable to express his infatuation with Hannah (Mia Wasikowska). Like the opening scene, this harmony is only broken by the entrance of a stranger, but this time the man is Simon’s doppelganger. James Simon (Eisenberg, again, and working in an impressively different register from his Simon James) looks and dresses exactly like Simon, but is an extroverted, aggressive and confident womanizer. The qualities he exhibits are everything Simon desires but lacks. Simon befriends James at first and the doppelganger seemingly enjoys teaching him the tricks of his trade, but their relationship begins to sour as Simon is forced to live under James’s successful, popular shadow. James passes by the same guard who stops Simon, he orders to the same waitress who ignores Simon, spends the nights with Hannah that Simon yearns for, and becomes Mr. Papadopoulos’s favorite employee. It is never explicated how others differentiate between the two, neither to the audience nor to Simon, but the experience mentally wears Simon down. Entrapped in a web of paranoid aggravation, he lashes out against James and everyone else around him, and in the process, drives himself further toward derangement. Ayoade’s treatment of the material is boldly stylized, with aesthetic nods to directors as varied as Terry Gilliam and Jean-Pierre Jeunet to Alfred Hitchcock – from whose Rear Window the film borrows heavily in constructing Simon’s unrequited romance with Hannah. But the director has shaped a voice of his own, and moved well beyond the superficial comparisons between his first feature and the films of Wes Anderson. Ayoade’s film lacks the challenging subjectivity of the original novella, as it never convincingly allows the audience to empathize with Simon’s plight. Yet, one can argue that our emotional detachment from Simon mirrors his own psychological state, for he cannot fully grasp the situation he finds himself in. This is by no means a film in which style prevails over substance. The meticulously crafted environment is temporally nebulous but paradoxically specific all the same. Its absurdity creates an alienating distance between us and Simon’s living and working spaces. In effect, we enter his world, but remain as mystified by its peculiarities much in the same way that he does. This balance between immersion and distanciation becomes the force that propels the film. We are at once looking at Simon from the outside in as he spirals further down but can’t help but share his horror. The central premise of The Double is universally relatable: a fear of unfulfilled potential, of seeing a better but unattainable version of one’s self. That Ayoade visualizes this fear so impeccably makes the experience all the more palpable. We, along with Simon, begin to lose our grip on reality. As the boundaries continue to vanish between what is real and what is a product of Simon’s disturbed imagination, the director’s heightened sense of style, with the arrhythmic cuts and saturated colors attuned to a disturbingly hypnotic score, becomes reflective of Simon’s troubled mental state. This kind of modestly scaled, but hyper-stylized expressionist filmmaking is increasingly rare in today’s cinema, making The Double a welcome surprise. With this film, Ayoade establishes himself as a vibrant and unique voice in cinema, one whose take on familiar thematic and formal tropes yields excitingly fresh results. I just read your last paragraph (no spoilers for me) and I'm already S-O-L-D. It sounds like just what the trailer promised. Yes, it's better than it looked from the advertisements to be honest.